Mannup Collectibles was formed in 2011 with a simple idea: acquire high quality key books in the best grades available, with a focus on CGC-graded material. "I believe that Golden Age comics have the greatest long-term potential of all comics collecting options," founder R. Cat Conrad says. "The age and rarity of those issues, the beauty of some of the art, and the nostalgia for the period create the perfect collecting environment ... one that lasts." One thing that sets the Golden Age market apart from other eras is the historical significance of it; Golden Age comics began during a period of international upheaval, and reflected the times in which they were created. Paper drives for the U.S. war effort saw the destruction of tens of thousands of copies from the World War II era; those that survived in high quality condition became highly collectible and desirable. The rise of popularity of the comic genre since the 1970s has seen a rising and continuing interest in the stories and art from this important creative and artistic period, and a desire to preserve the remaining books in as stable a condition as possible. Due to all this, Golden Age comics have become the central core of Mannup's collection, and we believe that it will remain the "blue chip stock" of comic book collecting for many years to come. 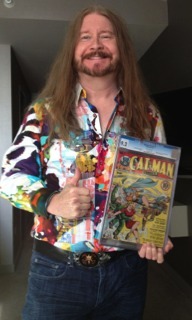 Mannup's founder R. Cat Conrad has been a comics enthusiast since he was old enough to attend early comics conventions and buy his favorite issues. By the late 1980s he had amassed a significant Silver Age collection, including many Mile High (Church) pedigreed books. Since that time, he's excelled as a science fiction and fantasy illustration artist, as well as a collector of comics and illustration art. Mannup Collectibles is the natural evolution of a true fan of the genre, from fan to professional.